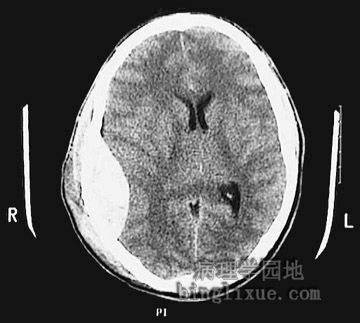 This is intraventricular hemorrhage (IVH) which arose in the subependymal region (germinal matrix) of a 28 week gestational age newborn. The germinal matrix region is very susceptible to such lesions at this period of development, leading to IVH as a complication of prematurity. 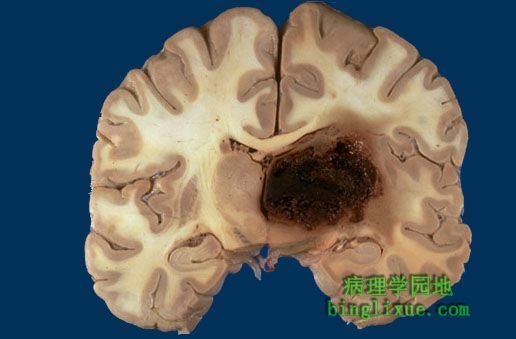 Hemorrhages involving the basal ganglia area (the putamen in particular) tend to be non-traumatic and caused by hypertension, which damages and weakens the small penetrating arteries. A mass effect with midline shift, often with secondary edema, may lead to herniation. 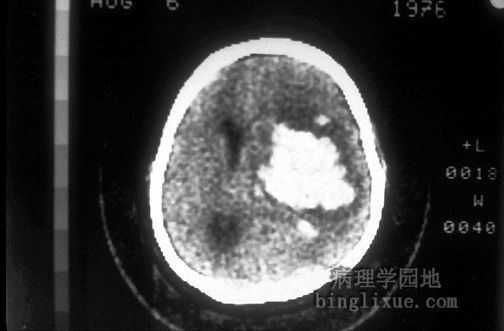 This is a computed tomographic (CT) scan demonstrating a hypertensive hemorrhage in the right thalamus that has extended into the ventricular system. 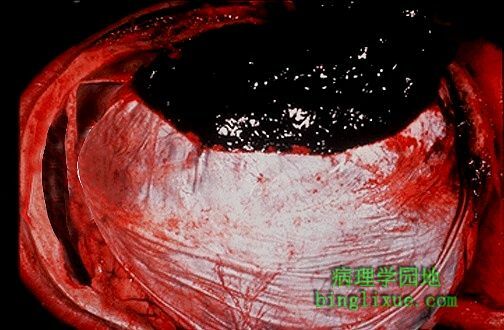 Hemorrhages in this location are not amenable to surgical intervention with removal of the blood. 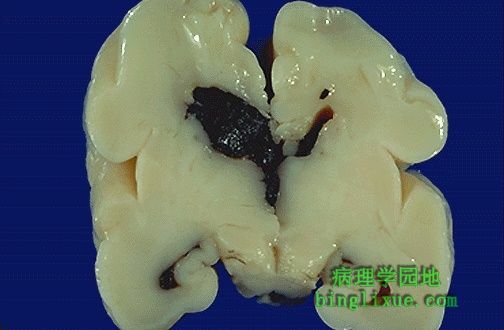 The large hemorrhage in this adult brain arose in the basal ganglia region of a patient with hypertension. This is one cause for a "stroke". 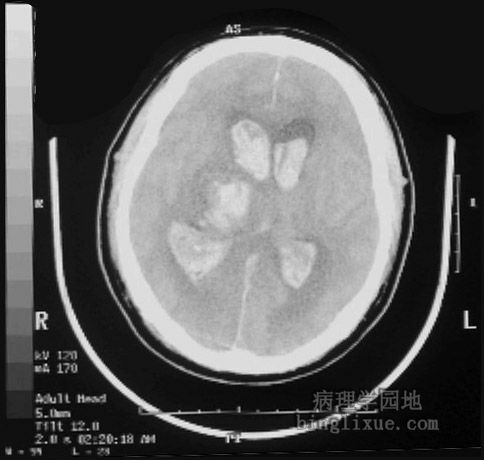 This computed tomographic (CT) scan of the head in transverse view demonstrates an area of hemorrhage in a patient with a history of hypertension. A blood clot is seen over the external surface of the dura. 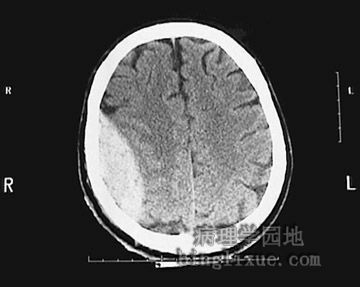 Thus, this is an epidural hematoma. 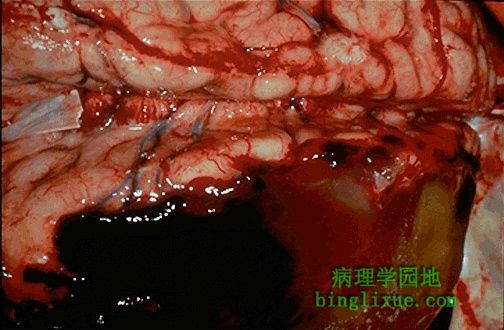 Such a location for hemorrhage is virtually always the result of trauma that causes a tear in the middle meningeal artery. This is a sagittal head CT scan without contrast demonstrating a large epidural hematoma with right to left shift and ventricular narrowing. 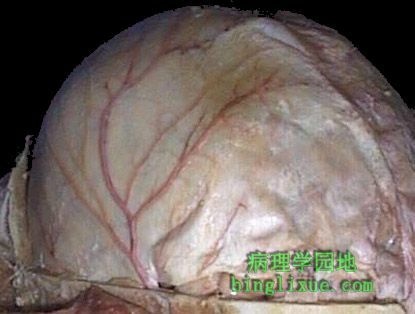 The top of the skull is removed to reveal the middle meningeal artery which has emerged from the foramen spinosum to branch over the surface of the dura. 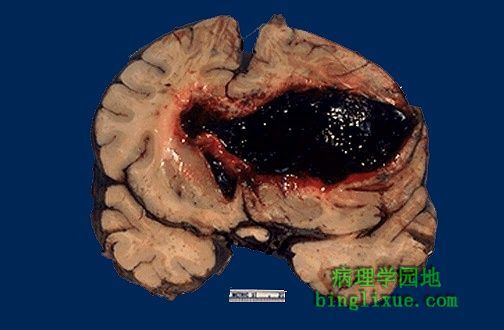 The dura has been reflected back (with a small portion visible at the lower right) to reveal a subdural hematoma. Such a blood clot is usually the result of trauma with tearing of the bridging veins.